Do you use baby powder? Have you thought twice about its safety? For years, without knowing, and blindly trusting, many of us apply harmful chemicals to our delicate parts, such as our bottoms, feet, armpits, and groin — anywhere that is moist and emits odour. Unfortunately, the talc in baby powder destroys our delicate skin and microbial community and confuses our immune system, sprouting cancer in reproductive organs. Massive lawsuits were recently awarded to cancer sufferers by Johnson & Johnson, the formulators of baby powder. On August 21, 2017, a jury in California recently ordered Johnson & Johnson to pay $417 million to a woman who says she developed terminal ovarian cancer as a result of using the company’s baby powder. And in February 2016, a Missouri court ordered Johnson & Johnson to pay $72 million in damages to the family of Jackie Fox, a woman who died of ovarian cancer. Both lawsuits said the cancer was linked to their longtime habit of applying baby powder. Two other Missouri court cases against Johnson & Johnson went in favour of the women who sued, leaving the company on the hook for $197 million. And more than 2,500 lawsuits are pending in the state. Nearly $700 million dollars has been paid out to women who have suffered serious illness and death for simply using something many of us have not been properly informed comes with serious health consequences. We assume that just because it’s advertised as safe for our babies that it is. My goal in this article is to give you the full disclosure you haven’t received, and talk about the hero woman of this story who died in the process of getting the truth out. How Can We Protect Ourselves From This? Let’s distinguish between: What’s proclaimed vs. not disclaimed? When will these lawsuits be enough for us to listen? Who are these people? The 1% in charge of virtually every message we hear from the skewed media and news, and so-called beauty and health products. So what’s the problem with talc? Talcum powder is made from talc, a mineral made up mainly of the elements magnesium, silicon, and oxygen. As a powder, it absorbs moisture well and helps cut down on friction, making it useful for keeping skin dry and helping to prevent rashes. It can be found in powdered cosmetics, deodorants, and more. Talc is a powdered native hydrous magnesium silicate sometimes containing a small portion of aluminum silicate. Talc can be contaminated with asbestos fibers, posing risks for respiratory toxicity and cancer. Studies by the National Toxicology Panel demonstrated that cosmetic-grade talc free of asbestos is a form of magnesium silicate that also can be toxic and carcinogenic — so much so that it is banned in the EU as well as in Canada, both of whom place much more scrutiny on the ingredients allowed in their food and drug products. So why are these things not banned in America? Although many attempts have been made by doctors, researchers, and attorneys since the first discovery of its potential threat to our ovaries, J&J still refused to change the formula. Dr. Daniel Cramer, a professor of obstetrics and gynecology at Brigham and Women’s Hospital in Boston, has served as a paid consultant on several ovarian cancer cases against Johnson & Johnson, and published one of the first studies noting an association between talc and ovarian cancer in 1982. It found a 92% increased risk for ovarian cancer with women who reported genital talc use. According to the EWG on this site, 23,653 studies in PubMed science library may include information on the toxicity of this chemical. In 1993, The United States National Toxicology Program concluded “talc is a carcinogen.” Then, in 1996, the condom industry stopped dusting condoms with talc at the request of the U.S. Food and Drug Administration (FDA), which was the direct result of the scientific concern about the ovarian cancer risk from vaginal exposure to talc. The International Agency for Research on Cancer, part of the World Health Organization, also called talc a possible carcinogen in 2010. Yet, even after paying over half a billion dollars in lawsuits that Johnson & Johnson baby powder had a direct link to these womens’ cancers, they deny the toxicity of their product and continue to stand behind it. “Several decades of medical research do not support the hypothesis that use of talcum powder causes ovarian cancer,” said Dr. Hal Lawrence, chief executive officer of the American Congress of Obstetricians and Gynecologists. Other Risk Factors of Baby Powder — Hormonal Chaos? Talc aside, another group of chemicals called Phthalates are commonly found in baby lotions and powders. This class of ingredients, also abundantly formulated in cosmetics, is among 70,000 other registered chemicals that have hormonal effects on the body. These factors are called xenoestrogens, foreign estrogens that mimic the functions of our natural estrogens. When they enter our body, they attach themselves to our cells’ receptor sites, taking over our naturally produced estrogens’ functions to control growth and development, negatively affecting our breasts, skin, menstruation, and fertility. Over time, high exposure to these ‘fake estrogens’ can promote unnatural growth in tissues such as fibroids, cysts, tumours and weight gain. It also wreaks havoc on the endocrine system, leaving women with a myriad of hormonal health imbalances, one of the most common conditions I see today in my practice. PMS, heavy bleeding, cancer, PCOS, infertility, acne, mood swings, chronic fatigue, weight gain, and more are all too misunderstood by the medical community and thought to have unknown causes. Research suggests it’s caused by a condition called Estrogen Dominance, however, the result of an accumulation of chemicals in the body. Essentially, all the products we use on a daily basis and the effects of their ingredients stack up over time. So the next time you read a study that says “not toxic in small doses,” ask yourself how much these small doses of various products add up over years of use. We’re putting hundreds of different products, full of xenoestrogens, onto our bodies. When applied to the skin, they are far more potent than those ingested orally, because they travel directly to the tissues instead of passing through the liver. So even if talc weren’t the issue, as per Johnson & Johnson’s representatives, perhaps you should consider seeking alternatives due to these negative ramifications. Studies are now showing that one in two men, and one in three women in this generation are estimated to have cancer, and over 75% of America is now overweight or obese, at least in part because of the hormonal imbalances caused by xenoestrogens, we should all aim to reduce our exposure as much as possible. Read how here. #2 When Will These Lawsuits Be Enough for Us to Listen? Johnson & Johnson knew about the risk since the early 1980s, and even before, yet did not protect its customers. The medical community is nevertheless claiming to ‘not know’ the cause of ovarian cancer — but I beg to differ. Overwhelming proof shows that for most cancers today, the underlying cause is manmade chemicals, environmental toxins, and in a large proportion of cancers, xenoestrogens. My question to you is, when will it be enough? How many kids ‘dying too young’ of cancer need we witness? How exhausted, hormonally imbalanced, diseased, and infertile do we need to become? How many lawsuits, how many women have to suffer, how many loved ones die, before we wake up and learn from their losses? Ms. Echeverria, who was too sick to testify in court, started using Johnson’s baby powder when she was 11 and continued after being diagnosed with ovarian cancer in 2007, unaware that some studies had linked talc to cancer, said her lawyer, Mark Robinson. She stopped using it after hearing news reports of a verdict in another lawsuit against Johnson & Johnson, he said, and now wanted to warn other women. And good she did, as a warrior champion of ovaries and baby butts everywhere. Now let’s talk alternative solutions. Thankfully, there are plenty of other choices you can use instead that you probably already have in your kitchen! Sodium Bicarbonate works very effectively to absorb odour. Apply it just as you would baby powder. As with all things, however, you should test out a little at a time to see how your body reacts, especially because these are sensitive areas. Be sure to purchase the kind without aluminum so your heavy metal levels don’t look like the below chart. 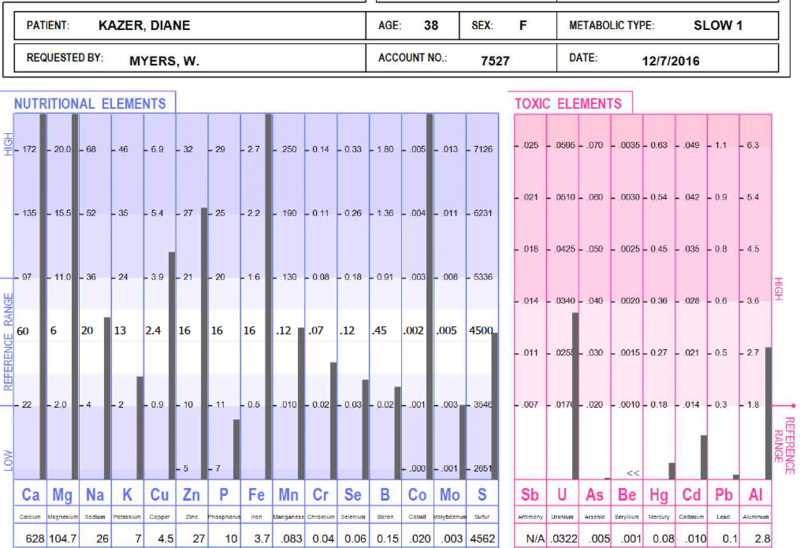 I test for heavy metal toxicity in my online nutrition company, and often see metals in excess of safe ranges, which negatively impacts our health, causing auto immune disease, neurological damage, and brain disfunction, and has ties to virtually every symptom you can think of. Arrowroot is derived from several tropical South American plants. Tapioca starch is derived from the crushed up pulp of the South American cassava plant, a woody shrub. I bought it long ago to use in my vegan and paleo recipes as alternatives to flour and cornstarch that otherwise are genetically modified and filled with heavy metals, which leech minerals such as zinc, Vitamin C, and iron from our body. Since zinc is perhaps the most important mineral to boost immune health, we want to stay as free from GMO ingredients as possible, to combat cancer. Diatoms are hard-shelled algae that come from bodies of water and have a high silica content, which makes it good for hair and skin use. It’s been called a miracle dust. This miracle powder also works as a ‘deodorant’ to decrease odour. You can also use it in hair to ditch dandruff and also sprinkle it into your shoes (instead of talc) for foot fungus. If you are going to buy it, make sure it’s food grade diatomaceous earth. You can get a huge 10 pound bag for around $20. It’s our job to pay attention and be mindful of the things we put on, in, and around our body. We must stop assuming that decades old FDA regulations are in place to protect us. It is impossible to test for reactions of not only how one unique person would react to these harsh ingredients, but also how two or thousands of combinations react inside of the body. So it’s on us to research and test ourselves. I am still surprised to hear how many people don’t realize that what you apply to your skin becomes a part of you, just as any bite of food you take does. Your skin eats too, and these applied toxins become a burden to our organs of elimination. I’ve worked with thousands of clients and this is the most under-addressed topic, which most don’t consider could have such a drastic impact on health. You could eat the perfect diet, and have the perfect exercise/yoga/rest routine, but if you’re slathering toxins like talc to your body, your odds of disease, fat, fatigue, and frustration are still very high. Bottom Line: If we love on our skin-biome and treat it well, it can keep us energetic and happy, reduce pain and disease, and lessen the signs of aging. The best two ways to do this are to feed our body probiotics (this is the brand I use), and then consume food for these bugs with prebiotics such as leafy greens and fermented foods. I teach this, step by step, in my four-week online program, The Warrior Cleanse. Then, stop consuming and applying things to the skin and body that destroy the ‘good guys’ within it. For a great resource on what products are safe to put on your body, check out the free online resource, Environmental Working Group at EWG.org. For more empowering articles just like this, and how to steer clear of these toxins, check out my website, Facebook page, and Youtube channel for all things hormones/cleansing and fat burning fitness! Cleanse your Body, Heal your Hormones, Ignite your Life!